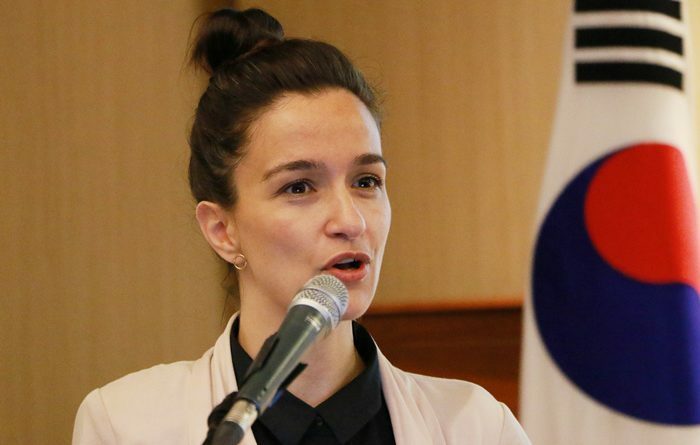 Diana Dovgan, CICOPA Secretary General, and Hyungsik Eum, CICOPA’s Data Analyst, took part in the conference “Future of Work and Worker Cooperatives” in South Korea, on July 12 and 13, organized by our member, Korean Federation of Worker Cooperatives (KFWC). The first day, the conference was held in Seoul and the second day in Daegu, in the framework of the Social Economy Week. CICOPA’s Japanese member, JWCU, Belgian member SMART.Be, and the Director General of the ICA, Bruno Roelants also took part in the conference. The objective of the event was to promote the worker cooperative model, particularly its potential role in the Future of Work debate. Alongside the conference, meetings with stakeholders from the cooperative movement and social economy actors were organized, as well as visits to cooperatives. In spite of the increase of number of cooperatives since the Framework Act on Cooperatives (2012) the number of worker cooperatives in South Korea has been relatively small and their contribution not fully recognized by the government and social partners. However, an increasing interest in worker cooperative model has been noticed, as potential answer to some specific challenges such as workers buyouts, collaborative economy, informal work in the care sector and securing work for freelancers trough cooperatives. ← How worker, social and producers cooperatives contribute to a sustainable economy?